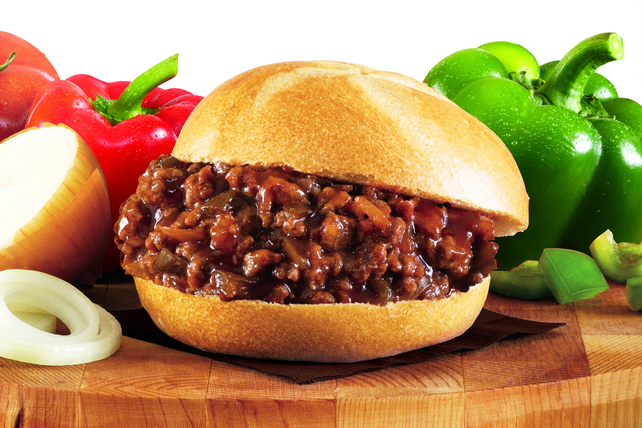 Sloppy joes are a family favourite and this classic easy-to-make recipe is sure to please. Sandwiched in buns, sloppy joes only need a salad to complete the meal. Brown meat with onions and peppers in large nonstick skillet, stirring frequently. Add ketchup, Worcestershire and sugar; mix well. Simmer on medium-low heat 10 min. or until slightly thickened, stirring occasionally. Fill buns with meat mixture just before serving. Prepare using ground chicken or pork. Add shredded lettuce, chopped tomatoes and/or your favourite Kraft Shredded Cheese to the sandwich filling. Substitute Heinz Chili Sauce Chunky with Sweet Peppers for the ketchup.